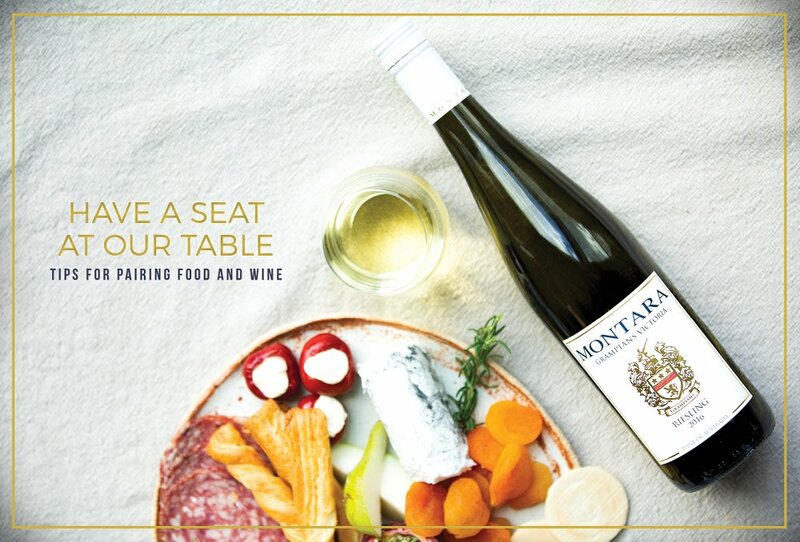 At Montara we believe our wines are best enjoyed with friends, family and delicious food. Check out our pairing tips for your next dinner party or Sunday lunch! Eat and drink seasonal wines and food. Support your local community! Victoria is a melting pot for fresh food and wines. Check out your local farmers market for seasonal produce and match it with local wines. If you’re cooking for family and friends and love using a bit of chilli, look for wines that can cut through the flavours. Wines that are higher in acidity, such as Riesling and Sauvignon Blanc, will marry well with hot foods. Lighter reds like Pinot Noir work nicely with mild foods and allow the flavours to develop further. If you enjoy cooking bone-in meats, look for a richer or more robust red, such as a Cabernet Sauvignon or Shiraz. Forget the tasting notes while you’re around the dinner table! Talk as a collective about taste, texture and your experience with the wines and food. Matching food with wine doesn’t have to be over complex—keep it simple. If you’re not a wine drinker you might find that wine isn’t always love at first taste, but with a little time, it helps facilitate your taste and senses. A whole new level of enjoyment of food, wine, and good company will open up!